We often get calls here at Federal Home Loan Centers laced in confusion. How exactly federal home loans are different than conventional bank loans, is the key question on their minds. Down payments and closing costs are conventionally a big piece of the mortgage process. Thankfully, USDA and VA home loan programs do not require a down payment. While you do not need that money upfront for those two loans, it is suggested you have money for closing costs, which can vary from two percent of the loan’s value up to six percent. There can also be lender and seller credits, which can help you cover closing costs. Seller credits can be negotiated when making purchase offers. Lender credits are on a case by case basis. For FHA home loans, you will need to be able to do a 3.5 percent down payment. This money can be gifted from others, but it still needs to be available as physical money to put down upon the purchase of a home. As stated above, seller and lender credits can help with closing costs. Down payments on conventional home loans range from 3% to 20% and will typically require a minimum of a 620 credit score. If less than a 20% down payment is made, then PMI will be required (private mortgage insurance). The monthly amount of your mortgage is going to depend on if a down payment was given, what the set interest rate was, what your property taxes are and the monthly homeowners insurance, and if the lender helped with closing costs. Some of the fees may be avoided with certain federal home loans, pending on your circumstances. Interest rates with federal home loans can be one percent or lower than conventional loans, and this is without having perfect credit or leaving a big down payment. When a Chapter 7 bankruptcy occurs, two years will be the standard waiting time to qualify for a federal home loan. A three year wait is required with the USDA home loan. A conventional home loan will not be within your reach, typically, for four years. Chapter 13 bankruptcies, with 13 months of on time payments, will get you a federal home loan after those 13 months of on time payments have passed. You will wait two to four years for a conventional loan. If a short sale occurred, you can get another VA home loan immediately if all mortgage payments were on time, whereas any late payments will result in a two year waiting period. Three years will be your waiting time for new FHA and USDA home loans. Conventional home loans will leave you with a four year wait. Now we come to foreclosures, which is the scariest word in the mortgage process. Let’s start with the bad news first: you will need to wait up to seven years for another conventional loan. The upside is you only have a two year wait for another VA home loan, or three years for a new FHA or USDA loan. As you can see, waiting times can vary wildly. Getting approved again after any of these events will also depend on your credit score and factors like income, savings, and employment. Funding fees are typically 1.75 percent for FHA loans, can go from zero to 3.3 percent for VA home loans, and will be around one percent of the loan for USDA home loans. 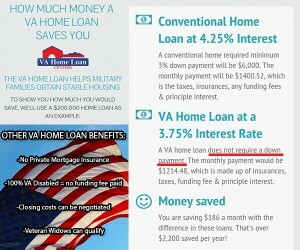 It is possible to add the funding fee to the overall loan and certain borrowers (like disabled veterans) can even get a waiver. Federal loans will typically need to abide by county limits. The limit seen through most of the county currently is $484,350 for a single unit up to $605,525 for a fourplex, whereas expensive areas with higher limits, such as San Francisco, can see higher limits. San Francisco’s limit is currently at $726,525 for a single unit up to $1,397,400 for a fourplex. Federal home loans are meant to get Americans into housing that is suitable enough for their needs and their budget, so while getting a jumbo loan that exceeds county limits is possible, it can be tricky. People can use FHA and VA home loans on multi-family properties and use rent to help pay for the mortgage, but the catch is that the borrower needs to be using one of the units as their primary residence. Federal Home Loan Centers is happy to take further questions on federal mortgages over on Twitter at @fedhomeloan or by calling 877-432-5626(LOAN).